Kalyana murungai is a very rare plant with amazing medicinal uses and health benefits. Kalyana murungai plant treats cold and cough, strengthens bones, is good for women as it treats many ailments that women regularly face, absorbs toxins and it is also a wonderful muscle relaxant. Kalyana murungai is generally taken in the form of kalyana murungai juice and kalyana murungai powder and we can also include kalyana murungai leaves in our day to day recipes easily. 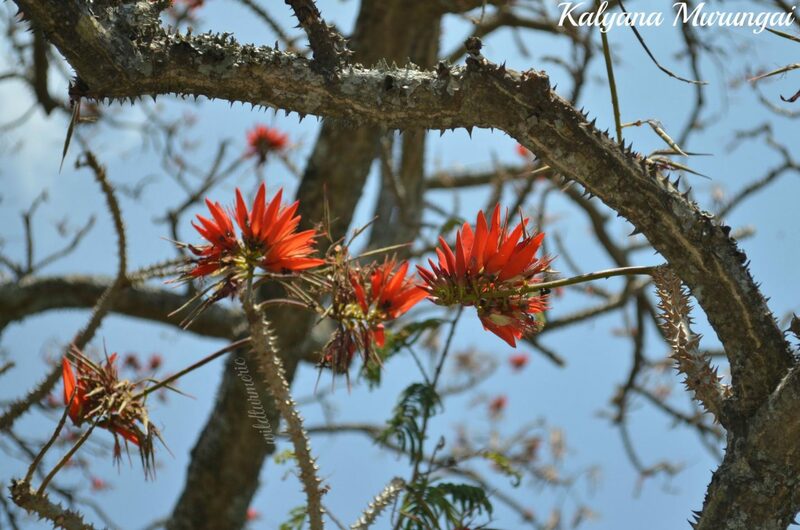 Kalyana murungai is a thorny, deciduous tree that grows about 65 to 70 feet tall. 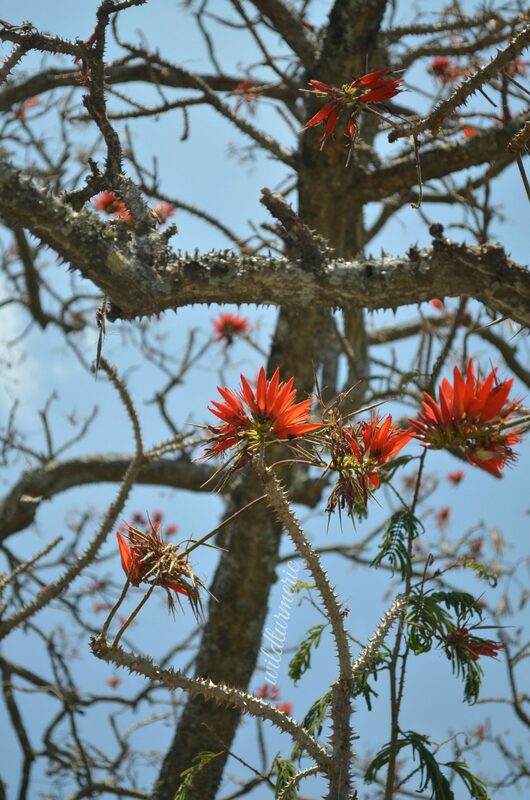 The whole tree is covered with thorns and between the months of July and November, the tree produces beautiful bright red flowers. 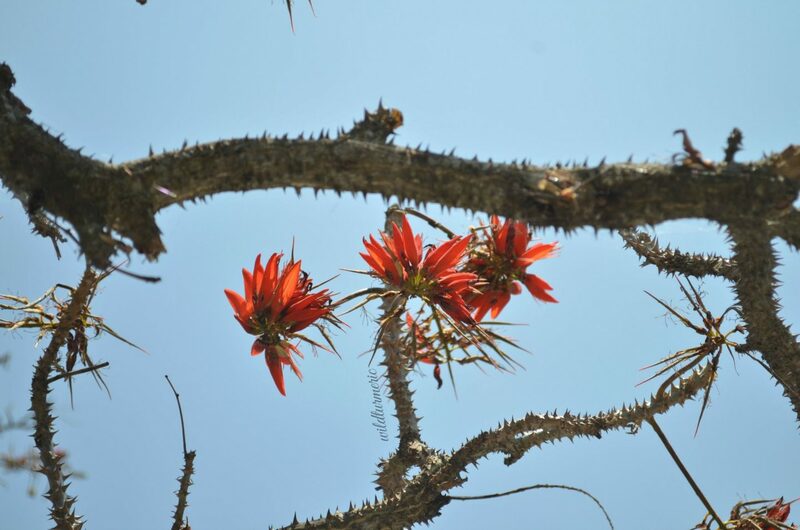 We can easily identify the tree with the thorns and bright red flowers. After flowering, the tree produces red-brown seed pods that contain poisonous seeds. The bark and the leaves are the most used part in traditional medicine. Kalyana murungai used to be commonly found everywhere in Tamil Nadu but nowadays it is not very common. We don’t have a single Kalyana murungai tree in our village, only the local forest near our village has plenty of kalyana murungai trees. Almost all parts of the tree are extensively used by indigenous tribal people to treat many ailments. Usually kalyana murungai is highly recommended for women as it strengthens the uterus, prevents bone loss and also treats periods pain. In some parts of Tamilnadu, kalyana murungai is included in marriage rituals so to encourage the bride to use it to have a strong uterus. The botanical name of kalyana murungai is Erythrina Variegata. 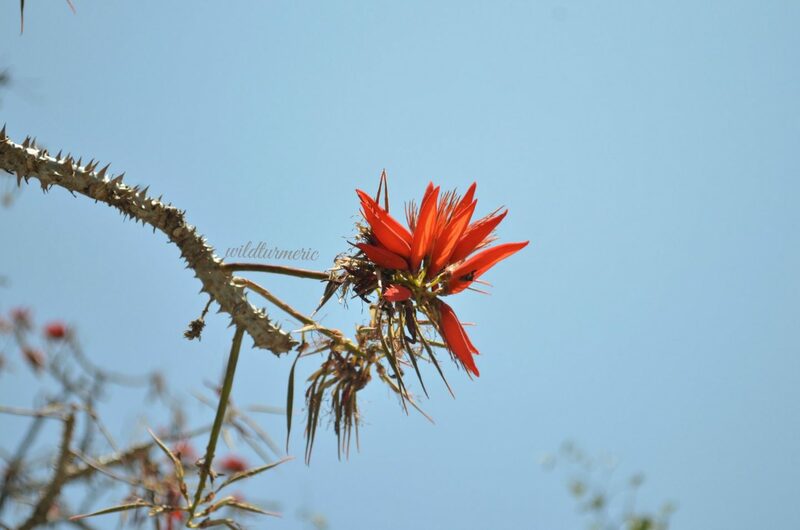 It is called Coral tree and Tiger claw in English, Pangri or Pharhada in Hindi, Palita Madar in Bengali, Haluvana in Kannada, Mullu Murikku in Malayalam and Badida Chettu in Telugu. Kalyana murungai is the Tamil name, it is also called Mul Murungai in Tamil as the tree is covered with thorns. Kalyana murungai contains alkaloids flavonoids, pterocarpans, triterpenes, proteins, lecithin and steroids. Some of the important flavonoids present in kalyana murungai are erythrinins A, B and C, isajin and alpinum isoflavone. Like our regular drumstick plant (murungai), kalyana murungai also has been used traditionally for treating lot of ailments. The leaves are used for reducing blood pressure. The leaves if consumed along with fenugreek is used to reduce body heat and it is also used to treat painful urination. The leaves if consumed regularly treats anaemia. The leaves are also used for treating skin diseases if applied externally. For women, kalyana murungai is used for reducing periods pain, increasing breast milk and strengthening the bones. It is also a good home remedy for constipation. It helps expel intestinal worms too, it is used to get rid of tape worm, round worm and thread worm. Kalyana murungai leaf poultice is used to relieve rheumatic joint pain. In certain areas, the leaves are used to treat eye problems. The alkaloids found in Kalyan murungai relaxes muscles and prevents spontaneous rhythmic contraction. It is because of this property that it is traditionally used to treat colic pain, periods pain and also for stomach pain caused by conditions like diarrhoea and indigestion. Kalyana murungai tree bark has wonderful anti-inflammatory properties. The bark extract is used to reduce fever and it also has analgesic properties so it reduces both body pain and the inflammation quickly. Kalyana murungai extract also reduces inflammation when applied externally as a poultice, you can read the study that supports it’s anti inflammatory properties here. Isoflavonoids present in kalyana murungai has amazing antibacterial properties and they are effective against staphylococcus aureus and other strains of bacteria. They are especially effective against oral bacteria so they help prevent dental caries by inhibiting the growth of cariogenic bacteria. Among the active compounds found in kalyana murungai, two compounds named erycristagallin and orientanol B have the highest antibacterial properties. Kalyana murungai leaf extract helps reduce blood sugar levels. Traditionally the leaf is boiled and the extract is taken to reduce blood sugar levels, this traditional use has been proved by research now. Though in the study methanol extract was used, water extract is also effective. In the study, methanol extract dose dependently reduced the blood sugar levels and you can read the study here. As we consume more and more of highly processed foods high in trans fat and preservatives, incidence of heart attacks are on the rise. Consuming cholesterol lowering medicines comes with a lot of side effects. There are wonderful natural herbs that helps lower high cholesterol. In a study, kalyana murungai extract helped reduce elevated total cholesterol, triglycerides and low density lipoprotein very effectively. Another amazing use of kalyana murungai is it helps prevent bone loss. Kalyana murungai extract decreases calcium and phosphorus excretion and also helps maintain ideal calcium and phosphorus levels. It has a protective effect on our bones and greatly helps prevent bone loss so it is important for us women to include kalyana murungai in our diets on a regular basis. Another very important function of kalyana murungai is it helps remove toxins. Water pollution is one of the major cause of diseases and two of the important water pollutants are zinc and cadmium. These minerals find the way into the water bodies as liquid waste from pesticide and pigments processing plants, mining plants and galvanising units. When we add kalyana murungai to the polluted water it absorbs these pollutants making the water safe. The raw seeds of kalyana murungai are poisonous but they can be eaten after boiling or roasting. It is best to consume kalyana murungai after consulting an ayurvedic physician during pregnancy. Also like any greens, if consumed in excess will lead to stomach upset and bloating. Generally one teaspoon of the powder a day is recommended. If you are consuming the decoction, 50 to 100 ml is the recommended dosage and if you are taking the juice, it is around 1 tbsp. But it is best to consume kalyana murungai supplements after consulting an ayurvedic physician especially if you want it consume it for long durations of time in large doses. Where To Buy Kalyana Murungai? We can get Kalyana murungai powder in all the nattu marundhu kadai shops in Tamil Nadu. You can also easily order it online too. We also get many ayurvedic formulations in which kalyana murungai is included as an ingredient and some of the important formulations are Sri Gopal Taila, Abhay Lavana, etc and these formulations are best consumed only under medical supervision. Collect the fresh leaves and fry them in castor oil for a few seconds till they slightly wilt. Wait for it to cool completely. Now take the fried leaves and apply on the inflamed area and then tie with a cloth to secure the leaves. This will greatly help reduce inflammation and will reduce the pain too. Take 1/2 cup of water in a pan, now add in 3 to 4 kalyana murungai leaves to it. Add in 1/4 tsp of jeera, 1/8 tsp of black pepper and salt. Let it boil till the colour of the water changes. Once the colour of the water changes, switch off, let cool and strain. Consume around 2 tablespoons of this decoction during periods to get good relief from periods pain. To extract kalyana murungai juice, take a handful of the leaves along with 2 tablespoons of water in a mixer and grind to a smooth paste. Now take the ground mixture in a strainer and strain to get fresh kalyana murungai leaf juice. Consume one tablespoon of this juice to get good relief from stomach pain caused due to indigestion, to remove phlegm and also to remove intestinal worms. Here in our place, we take handful of kalyana murungai leaves along with 1/2 teaspoon of turmeric powder and grind to a smooth paste and then strain to get a juice. We apply the juice to get rid of all skin problems. You can use it to treat small scrapes and wounds but don’t apply the juice on open wounds. Consuming kalyana murungai often is a very good home remedy for treating anaemia. One simple way to consume it regularly is to make dosas with it. To make kalyana murungai dosai, take a handful of kalyana murungai leaves and if the veins are thick, remove the veins and cut the leaves into small pieces. Now take them in a mixer and grind the leaves along with 1/4 tsp of jeera and 1/4 tsp peppercorns along with little water to a smooth paste and add it to a cup of dosa batter. Mix well and make dosas as usual and serve it hot with coconut chutney.